Living organisms in this world comprise of cells. There are unicellular as well as multicellular organisms present in this world. In unicellular organisms, the only single cell is capable of performing several functions such as Respiration, Digestion and Clearing of the cell. In multicellular organisms, there is a division of labor. There are different types as well as groups of cells that perform different functions in a multicellular organism. For Example, In animals muscle cells are responsible for causing movement, nerve cells are responsible for carrying messages and signals from one part of the body to another and blood is responsible for transportation of food and oxygen to different parts of the body. In plants, there are vascular tissues that are responsible for carrying food and water two different parts of a plant. Cells form groups cells that need to perform a single task often group together. 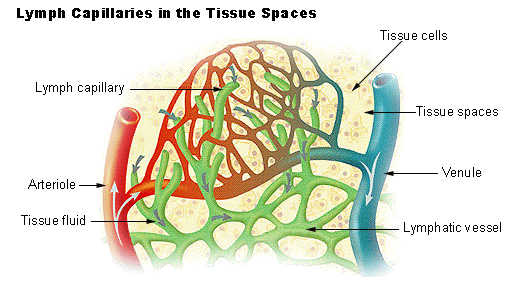 This grouping of cells together to perform a function efficiently is called a Tissue. For Example, Muscles and Blood. The tissue cells have the same structure and they perform the same function. Plants do not move so their tissues are predominantly the ones that provide support to them so that they can stand erect. Animals need more energy as compared to plants because they are not stationary. Their tissues are the ones that can support movement. These tissues are made up of dead cells because dead cells can also provide mechanical strength to the plants and do not require much maintenance. The tissues in case of animals are made up of living cells so that they can move and perform several functions. Only certain parts of the plant can grow. The tissues present in such regions of and divide themselves and form new tissues. Cells in animals grow uniform early and not only in certain regions of the body. The organs and organ systems in animals are highly developed. Only certain parts of a plant tend to grow. The tissues located in such parts are called meristematic tissues. They have the capability to divide themselves and form new tissues. They have thin cell wall made of cellulose. Also have dense nucleus and cytoplasm but lack vacuoles. They are found on the tips of the roots and stems. They are responsible for increasing the circumference of the middle part of the stem and hence are found there. These tissues are present at internodes or stem regions between the places at which leaves attach. 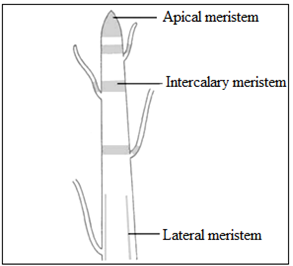 Why there are no vacuoles in the intercalary meristem? Vacuoles are responsible for storage of food in water. The intercalary tissues do not store them. They are rather responsible for manufacturing them. Moreover, vacuoles contain sap which provides rigidity to a cell. This property of vacuoles may not allow the intercalary tissues to divide and manufacture new cells. Hence vacuoles are not present in them. The cells that are formed by the meristematic tissues often have to take a certain role in the plant and thus, they lose their ability to divide and form more cells. They then become the permanent tissues of the plants. Differentiation - The process by which cells of the meristematic tissues convert themselves into a permanent tissue by taking a fixed shape, size and function is called differentiation. These tissues are responsible for photosynthesis, storage of food, gaseous exchange and floating of plants. These tissues are responsible for providing flexibility to the plants so that they can bend easily. These tissues are responsible for making plants hard and rigid. They are a group of living cells with cell wall made of cellulose. They are a group of living cells with cell wall made of cellulose and pectin. They are made up of dead cells having cell wall made of lignin. The parenchyma cells have large intercellular spaces between them. They have a little intercellular space in between them. The cells do not have any intercellular spaces. There are thin walls that surround each cell. The cells present in these tissues are broad and irregularly thick at corners. The cells have a long structure with thick walls. They are found in leaves and newly formed branches. They are present in leaves and stems of a plant. They are found in stems, veins of the leaves and coverings of nuts and seeds. These tissues are similar to that of parenchyma but they also contain chlorophyll in them. Due to the presence of chlorophyll, they are capable of performing the process of photosynthesis in plants. They are found in aquatic plants. They are also similar in structure to that of the parenchyma but they have large air cavities in them. These cavities allow the aquatic plants to float in water. The cell walls of dead cells have a substance called lignin in them which provides rigidity to the cells. Lignin acts as the cement for the cells. The outermost layer of the cell is known as the Epidermis. It covers the entire plant. It is a thin layer of single cells but in places with less water, the epidermis of the plants can become thick in order to avoid frequent water loss. The cells are flat and they have no intercellular spaces between them. The outer walls of the epidermal cells are thick and the inner walls are thin. 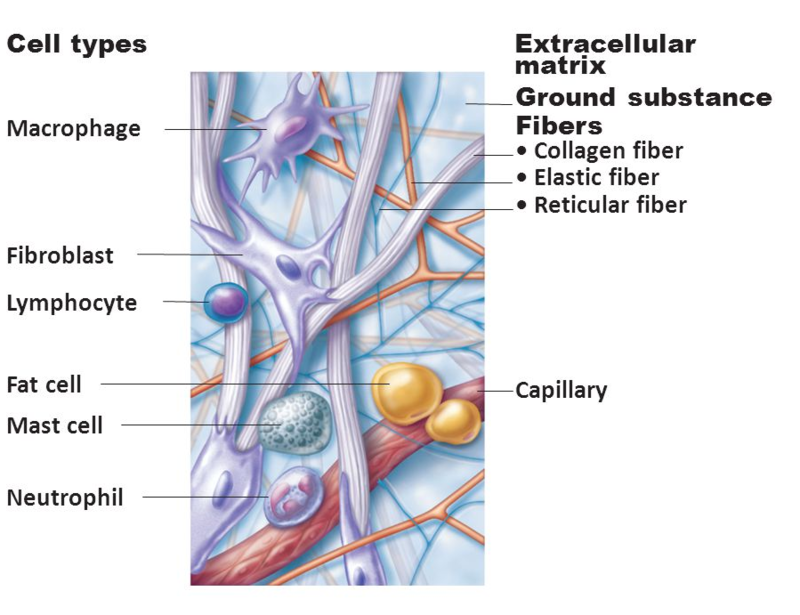 The epidermal cells often have long hair-like structures in roots which facilitate the absorption of water. The main function of the epidermis is to protect the plants from fungi, water loss and any injuries by secrets a wax-like water-resistant substance called as Cuticle on the surface of the plants which protects the plants. Stomata are pore-like structures that are present in the epidermis of the leaves. These pores are enclosed by two cells that have a similar shape as a kidney. These are called Guard Cells of Stomata. Guard cells are modified epidermal cells. Guard cells are responsible for the exchange of gases and transpiration. The plant cells when sometimes have extra they lose it in the form of water evaporates through stomata. This process is called Transpiration. Exchange of Gases - Plants absorbs carbon dioxide and release oxygen through transpiration. Prevent the Plants from Overheating - The leaves absorb sunlight during the process of photosynthesis. Some of it is used in the photosynthesis process while the rest is radiated as Heat Energy. We know that absorption of water causes cooling of the surrounding area. Therefore transpiration keeps the leaves cool. 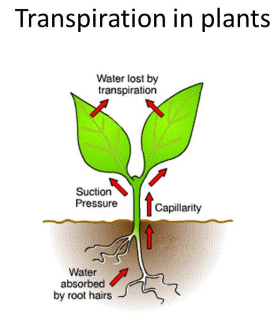 Transportation of Food and Water in Plants - The roots of the plants absorb minerals and water present in the soil through transpiration and they are then distributed in the plant through transpiration stream. Movement of Water in Plants – As plants lose water in the form of water vapors, the density of water in leaves becomes low. So the water from the higher density areas such as the roots move up to lower density areas through a force called Transpirational Pull. Which gas is necessary for the process of photosynthesis? The carbon dioxide gas is necessary in the process of photosynthesis. Plants use carbon dioxide along with water and sunlight to produce glucose in the process of photosynthesis. Plants take in carbon dioxide and release oxygen as a byproduct of the photosynthesis process. The epidermis cells of plants that are found in deserts have a waxy coating of cutin over them because it prevents water loss from the plants surface since water is already scarce in such areas. Why do branches of old trees are different than the stems of a new plant? As a plant grows older the meristematic cells start covering the upper layer of the plants instead of the epidermis. These are the dead cells that have no special function in the plants but to provide them rigidity. They make the branches of the plants thick. This is often called the Bark or the thick cork of the tree. Complex Permanent Tissues comprise of different kinds of cells. These different types of cells coordinate with each other and perform a common function in these tissues. 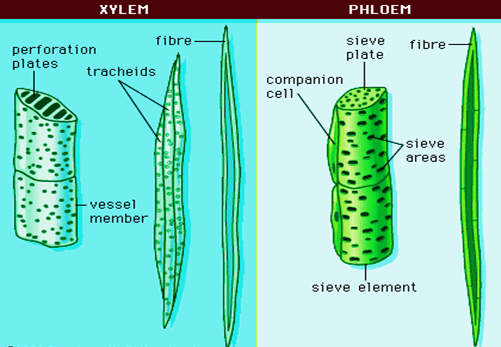 Two Complex Permanent Tissues are - Xylem and Phloem. Their main function is to carry food and water in the plant. Both have a vascular bundle which is a conductive tissue in plants that helps them survive in different environmental conditions. Tracheids and Vessels – They have broad tubular structure so that we can allow transportation of food and water in the plants vertically. Xylem Parenchyma – It stores food and helps in transportation of water horizontally in the plants. They are the protective tissues of the human body. They cover many organs and cavities that are present inside the body. 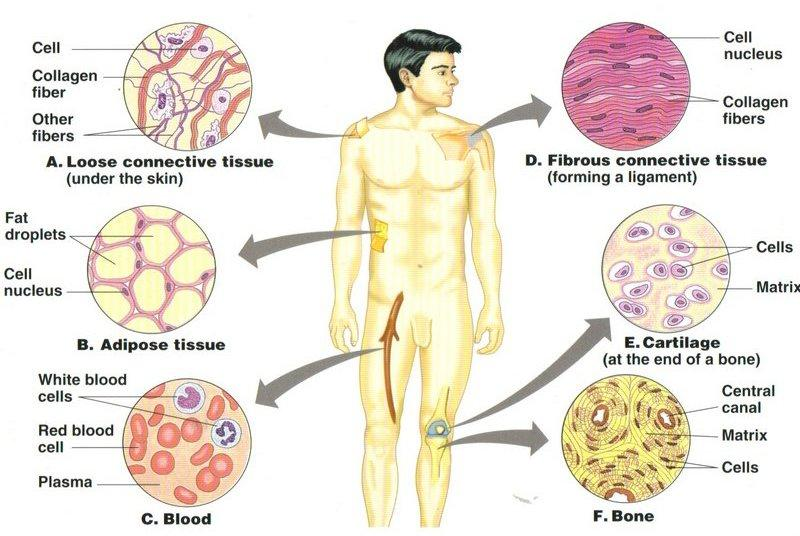 Where are the epithelial tissues found in the human body? The main function of the epithelial tissues is to act as a barrier and separate different organs and systems from each other. The cells are permeable. This makes it possible for them to exchange materials between different parts of the body and also between the body and the external environment. The epithelial tissues remain separated from the tissues beneath them because of a thin membrane over them. They are cube-shaped cells which are involved in absorption and secretion. They are loosely bound cells present in an intercellular Matrix. This matrix can be of different types – Dense, Rigid, Fluid or Jelly-like. Depending upon the functionality of the connective tissue, the nature of the matrix varies in them. The main function of blood is to transport gases, food, waste materials and hormones in the body. Therefore, blood has a fluid Matrix present in it which is called Plasma. The plasma contains the red blood cells, the white blood cells and blood platelets. The RBC have hemoglobin pigment which carries oxygen to tissues. White blood cells fight diseases and platelets are involved in clotting of blood when injured. The plasma also contains proteins and hormones in it. Lymph is a colourless fluid that carries white blood cells throughout the human body in lymphatic vessels. There are lymphoid organs present in the body that produce lymph and together form the lymphatic system. Some of them are lymph nodes and tonsils. It contains only white blood cells. It contains less amount of blood proteins, calcium and phosphorous but more glucose. It flows in one direction only. Lymph moves in the body through its normal function unlike blood which is pumped by the heart. Lymph Plasma – Lymph Plasma carries infection-fighting proteins along with other substances such as water, calcium and phosphorous. Lymph Corpuscles – Lymph Corpuscles comprises white blood cells. Red blood cells and platelets are not present in lymph. It carries oxygen and minerals to the cells in the body and carries back carbon dioxide and waste materials back into the blood. It keeps the body cells moist. It maintains the volume of the blood. It helps in eliminating harmful bacteria and virus from the body and hence is responsible for the immunity of human beings. It absorbs fats from the intestine and transports them throughout the body. Bones form a framework of the body over which the muscles are wrapped together. The bone tissue is strong and inflexible in nature. Therefore, the bone cells are present in a rigid matrix which is formed from calcium and phosphorus. The bones comprises of microscopic tubes called Haversian Canals. They are contained in osteons, rough cylindrical structures present along the axis of the bone. They allow the blood vessels, lymphatic vessels, and nerve fibres to travel through them. These canals have concentric channels called Lamellae around them. 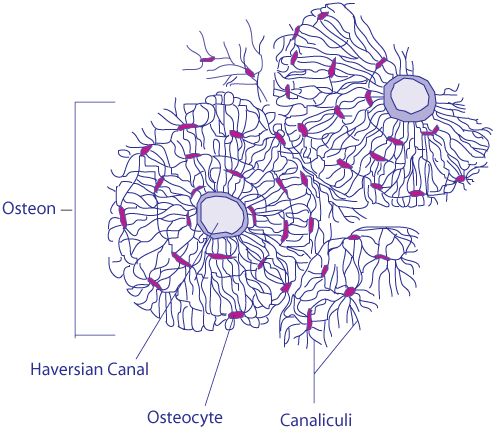 The Haversian canals communicate with bone cells through connections called Canaliculi. Cartilage is present over the joints of the bones and provides them with a smooth structure. For Example in the nose tip and ear pinna, trachea, larynx. They contain solid matrix made of protein and sugar. They have homogenous matrix. It provides support and flexibility to various parts of our body. A ligament connects two bones together. It has an elasticity which facilitates the connection. The cells of ligaments have a little matrix. The tendons tissues are responsible for connecting bones and muscles together. They have limited flexibility but very great strength. This tissue acts as a filter in between the spaces present inside the organs of the body. It helps in repairing other tissues as well. It is found in the skin and bone marrow. Fat Cells (Adipocytes) – They are responsible for secretion of lipids. Fibroblasts – They are the present in the highest amount in areolar tissues. They are responsible for secretion of fibres. Fats are stored in our body in the adipose tissues. They are found below the skin and between the organs of the body. Provides cushioning to the organs. It is made up of muscle fibers which are long cells. It allows movements in our body. How muscles can cause movement? They contain special proteins called Contractile Proteins. These proteins cause contraction and relaxation of the muscles. 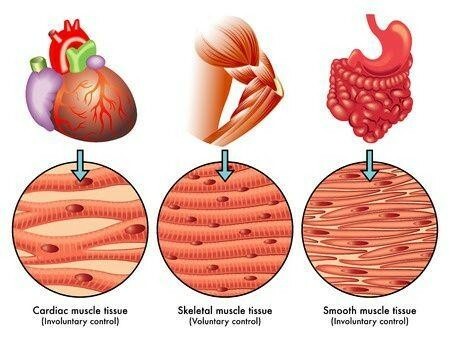 There are two kinds of muscles found in our body - Voluntary Muscles and Involuntary Muscles. We cannot start or stop the movement of involuntary muscles. They are also called Skeletal Muscles as they are attached to the bones. They also called Smooth Muscles. They are also called Unstriated Muscles because they do not have any light or dark bands on them. The cells of voluntary muscles have more than one nucleus, they do not have any branches, and have a long cylindrical structure. The cells of the involuntary muscles are long and have pointed ends. For Example, Muscles of our hands and legs. For Example, The muscles in the alimentary canal and the Iris of our eyes. These are special kinds of involuntary muscles. The muscles of the heart are called Cardiac Muscles they perform rhythmic contraction and relaxation throughout our life. They are cylindrical in shape, they have branches and there is a single nucleus. How do we react to stimuli? This is because of the nervous tissues present in our body. They are capable of transmitting information quickly from the brain to different parts of the body and vice-versa. Therefore nervous tissues are found in nerves, brain, and spinal cord. The Nervous tissue is made up of cells called the Nerve Cells or Neurons. These neurons connect together to form the nerves of our body. It is an elongated cell with a Cell Body that consists of some branch-like structure called Dendrites. There is a Nucleus present in the center of the cell body. The Nerve Endings of the cell are connected with the cell body via Axon. A nerve cell can be up to 1 m long. They are tree-like extensions (highly-branched) at the beginning of a neuron. They increase the surface area of the neuron. They receive chemical signals from different neurons of the body. They then convert these chemical signals into electrical signals and pass them to the neuron cell body. The main function of the cell body and nucleus of the neuron is to maintain the functionality of the cell. It does not play an active role in the transmission of the signal. It produces proteins that are required by different parts of the neuron to work properly. It contains different cell organelles such as mitochondria, Golgi apparatus etc that perform various functions of the cell. Neurons have one axon in general. It is a long structure that connects the cell body to the terminals and it also connects with other neurons, cells and organs of the body through nerve terminals. It allows in fast transmission of signals. The larger the diameter of the axon the faster it will transmit signals. It is covered with a special insulating substance called myelin. It helps in rapid transmission of signals. 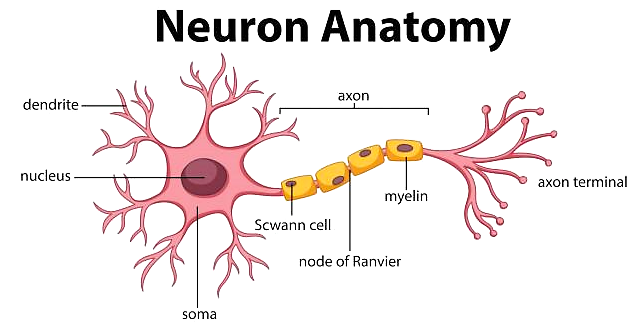 The Myelin sheath that covers the axon is produced by Schwann cells. Register and Get connected with our counsellors.